Dean Tsiranides of the Fairfield Prep Jesuits and Lazar Agoev of the Ridgefield Tigers wrestle in the 160lb weight class during the CIAC Class LL finals on Saturday February 16, 2019 at Trumbull High School in Trumbull, Connecticut. TRUMBULL — For the 19th time in the past 23 years, Danbury has been crowned the kings of Class LL wrestling. 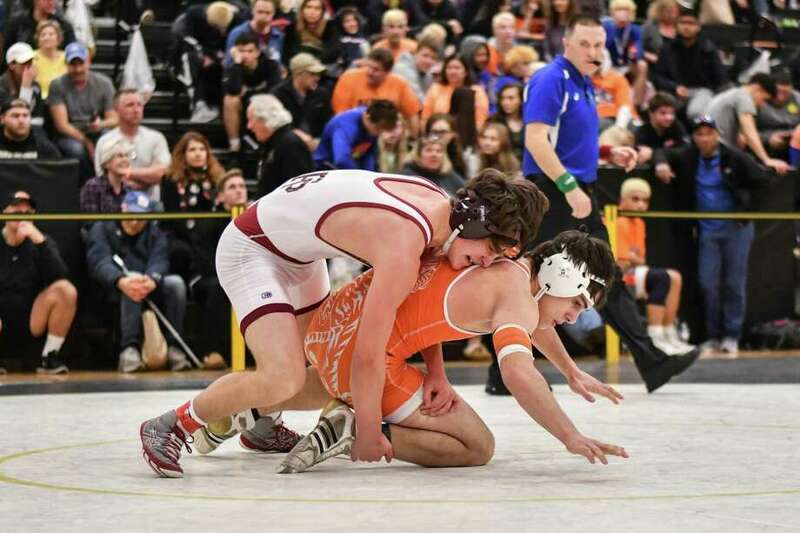 Danbury, the state’s top-ranked team, survived a strong challenge from the Trumbull Eagles and claimed the state title during the tournament this weekend at Trumbull High School. The Hatters had nine wrestlers reach the semifinals and six reach the weight-class finals with three claiming individual championships. For the second consecutive year, they’ll have 11 wrestlers in the 14 weight classes at the State Open, a fact that surprised even their head coach. Danbury scored 250 points with Trumbull scoring 210.5. Southington (175), Warde (150.5) and Staples (108) rounded out the top five. Jack claimed the 126-pound title when he rolled past Ridgefield’s Ben Smart 23-8 in the final. It was the third consecutive Class LL championship for Jack, who won at 106 pounds as a freshman and at 120 pounds last winter. He is unbeaten this winter at 32-0. Senior Kyle Fields also won his third state class championship when he defeated Chase Parrot of Westhill 4-2 in the 132-pound final. Fields, who also beat Parrot for the FCIAC crown last weekend, scored a third-period takedown to break a 2-2 tie. Danbury’s other weight class championship came from junior Tyler Johnson, who edged Norwalk’s Sam White in a tough battle at 120 pounds. Trumbull was impressive as well. The Eagles had 10 wrestlers place in the top six, with four finalists and two champions. Michael, a freshman, trailed Danbury freshman Kai O’Dell 1-0 in the third period, but scored two points on a takedown with 30 seconds remaining and won 2-1. Travis, the senior, had his focus divided as he prepared for his match while keeping an eye on his younger brother. Travis fell behind his opponent, Drew Currier of Hall, but eventually moved in front and won 6-1. “I think it’s really nice that in his senior year, Travis gets to win a Class LL championship with his brother,” Anderson said. Warde had three finalists with Noah Zuckerman and Joe Gjinaj winning titles. Zuckerman decisioned Tommy Mazur of Westhill 3-1 at 152 pounds, while Gjinaj went to overtime with Danbury’s Montez Osbey before winning 3-1 at 195 pounds. Gjinaj’s win was the second of two consecutive OT matches in the finals. At 182 pounds, Greenwich senior Andrew Nanai avenged an FCIAC loss to Trumbull’s Joe Palmieri, by defeating the Eagle senior 6-4. Nanai wasted no time getting on the scoreboard in OT, pushing the pace at the whistle and scoring a fast takedown. Southington had a pair of champions, with Jacob Cardozo defeating Warde’s Cole Shaugnessy, 3-2, and Billy Carr defeating Amity’s Andrew Seaton, 5-4. In the 138-pound final, Manchester’s Shamar Schand remained undefeated with a 5-2 win, although Trumbull’s Matt Ryan pushed him to the limit. Schand is now 31-0 this season. At 160 pounds, Ridgefield’s Lazar Agoev defeated Fairfield Prep’s George Tsiranides, 7-6, handing the Prep wrestler just his second loss of the season. In the heavier weights, Staples’ George Harrington defeated Hall’s Hugh Wells 7-3 to repeat as a Class LL champ. Harrington won at 285 last year. In this year’s 285-pound final, Newtown’s Joe Zeller scored the only pin of the finals when he defeated Danbury’s Jordan Agosto at 2:57.